This study provides a policy analysis of publicly funded school voucher programs. This research provides an analysis of voucher programs in Cleveland and Milwaukee and of political, legal, and programmatic constraints facing voucher programs. A synopsis of student test score analyses and parental surveys provides a basis for analyzing the effect of programs on participants. A survey of 30 individuals working with the Cleveland and Milwaukee public schools or voucher programs clarifies the effect of the programs on the overall educational environment. A review of financial data from the programs, pending legislation, national poll data, and court rulings provides an understanding of the policy constraints facing voucher programs. The research indicates that school vouchers have positively affected student participants' academic achievement and finds that public schools have adapted to the competitive impact of vouchers by initiating reforms aimed at improving schools. While the analysis indicates that legal constraints still loom over voucher policy, school vouchers have become politically and programmatically viable as a policy alternative. 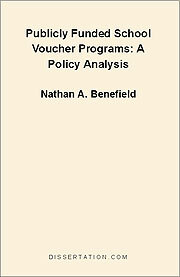 The study concludes that vouchers programs are a beneficial and, pending legal outcomes, practical policy alternative.